Redwood Falls Expands Farm To School! You are here: Home / NewsNONE / Blog / Redwood Falls Expands Farm To School! Redwood Falls has expanded its Farm to School offerings thanks to Taher, Inc. The District was looking to expand Farm To School and Taher answered the call. Here’s what the Redwood Falls Gazette had to say. “We started Farm to School here in 2010,” said Laurie Milbrandt of Taher, Inc, who serves as the food service director for the local school district. Her goal is to implement as much of the Farm to School concept as is possible in the local school food program. Milbrandt is always open to more ideas about how to increase the number of products offered to students that are grown by local producers. Milbrandt and other school administrative leaders hosted an event earlier this school year known as legislator to lunch, which provided an opportunity for elected officials at the state level to come and see how the Farm to School program is being implemented. 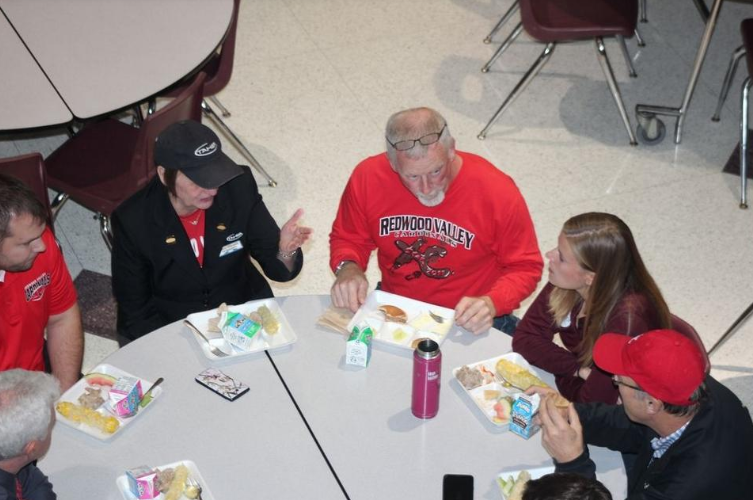 “I think this is a very good program,” said District 16 Sen. Gary Dahms, who visited the school, adding he sees the economic benefit to producers who can provide their products to the school, as well as the health benefits to the students. Read the full article at the Redwood Falls Gazette. What Is The Single Perfect Food?